Trikatu, is known in Ayurveda as ‘the three pungents’, and contains ginger, black pepper and long pepper. It is an important combination used by itself and in many Ayurvedic formulations for its cleansing, digestive, and stimulating effects. Digestion is one of the first body functions to suffer in the case of stress and tumultuous emotions, as well as improper self-care, eating on the run, a lack of exercise, and inappropriate or imbalanced diet. According to Ayurveda, most imbalances in the body begin with boggy, sluggish, or otherwise inefficient digestion. Trikatu with clove is a wonderful tool for getting the digestion back on track, and it can play an instrumental role in stoking the digestive fire that is so needed for optimal health. 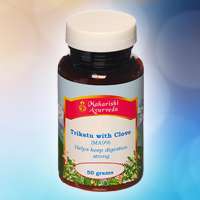 Maharishi AyurVeda Trikatu with Clove is a classic Ayurvedic blend of herbs that work in synergy to stimulate the digestive fire, or agni, allowing for more efficient digestion in the stomach while promoting proper bile flow, healthy detoxification and fat metabolism. The gentle heating action of this blend primes the digestive tract to digest food, absorb nutrients and efficiently remove wastes. The herbs in this formula are combined in precise proportions and prepared in the traditional Ayurvedic way. This improves the bioavailability of vital nutrients. It also creates synergy -- the collective benefit is much greater than that of isolated, individual herbs. Taken 15 minutes before a meal, Trikatu is a wonderful formula to have on hand when eating out, especially for those rich or heavy meals. It is also a rejuvenative for kapha, supporting healthy lungs and clear breathing. Not recommended when Pitta is high, and not to be used by pregnant women. 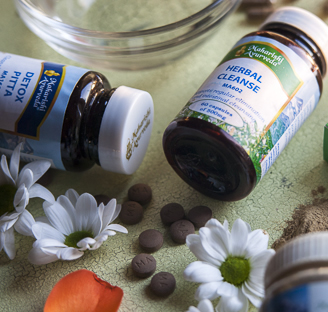 Digestion is one of the first body functions to suffer in the case of stress and tumultuous emotions, as well as improper self-care, eating on the run, a lack of exercise, and inappropriate or imbalanced diet. 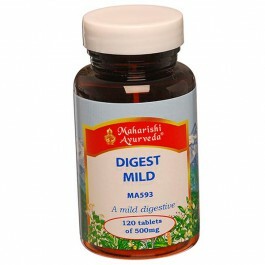 According to Ayurveda, most imbalances in the body begin with boggy, sluggish, or otherwise inefficient digestion. 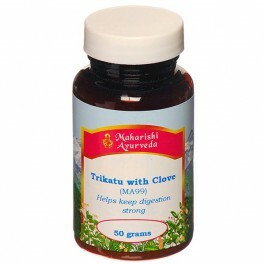 Trikatu with clove is a wonderful tool for getting the digestion back on track, and it can play an instrumental role in stoking the digestive fire that is so needed for optimal health. Trikatu supports the health of the stomach and helps keep digestion strong. Being a stronger digestive than "Herbal Digest" it is specially suitable after a heavy meal. Trikatu is three strongly pungent spices with added Clove. Take 2-4 grams 2-3 times daily with water. May be mixed with honey to support respiration.